Sri Anagha Datta Society of Calgary encourages cultural, spiritual and religious activities. As a part of the cultural support, the organization supports several local schools which impart training in Indian Classical arts. Natyanjali is a classical dance festival that encourages students who learn Indian Classical Dance forms to participate and showcase the art forms and the cultural heritage of India. Natyanjali 2019 will be held at the Wright Theatre, Mount Royal University, on May 11th 2019. The Festival was organized by Sri Anagha Datta Society of Calgary and seeks participation and sponsorship. Dance Schools all over Canada may participate in this, please email info@anaghadatta.org for more info and participation criteria. 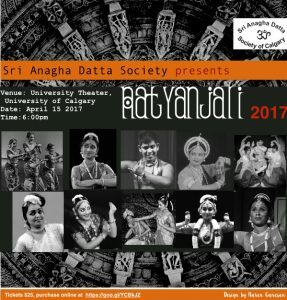 Sri Anagha Datta Society of Calgary has been conducting the Natyanjali Dance Festival in Calgary since 2007. May 12 2018 – Get your tickets now. Sri Anagha Datta Society has been conducting the Dance and music festivals annually since 2008 with help of local artists and teachers. Some of our most successful shows are. Over the years, we have supported several other groups in Calgary.